The I1R is a USB-rechargeable key chain light from Olight which boasts 130 lumens and at a super affordable price point of around $19 USD, you should pick one up and try it on for size. Overall, I’m impressed with the beam pattern (thanks to the TIR lens) and the fine knurling all over the body. Some things to consider is that the head has to come all the way off to recharge, so don’t loose it. Copied from Olight Store product page. The knurling is very fine but covers a large are which helps with grip. The size overall is pretty small but usable. The light uses a TIR optical lens for a smooth beam profile. The light comes with a single small key ring. The light is easy to open and there is a number of threads so it’s not likely it will come off by itself. I get a little anxious when I have to have exposed my threads to the world during charging as I don’t want them to get dirty and bind when I’m putting it back together. This beautiful, but short, micro-USB cable also comes with the light. The light uses a Philips LUXEON TX which I’ve never heard of before. Olight does not advertise the angle of main LED but from what I’ve collected it seems to be a 100 total degrees spill with a 40 total degree spot. 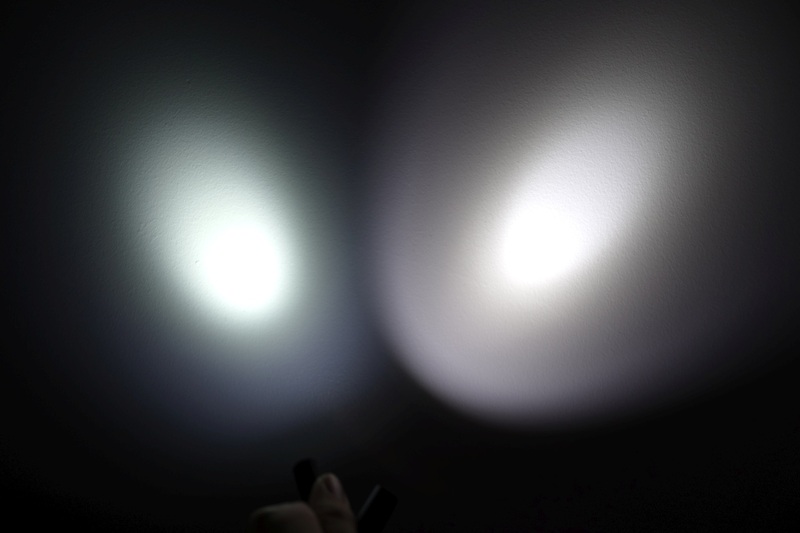 The light has a built in rechargeable 80mAh 3.7V Li-ion Battery. I tested and confirmed the capacity by observing the charging current over time, as shown below. The light took about 1h 17m to fully charge. Summing the current over time, I calculated at cell capacity of about 82 mAh. While charging, the indicator light will be steady red, when complete will be steady green. To be considerate to color blind people, Olight may want to consider adopting a blinking red and a steady green scheme. Pretty much as advertised, the light runs on High for 20 min. Soon after, I did a manual reset (turn the light off then on again) but the reset did not return the output to 100% output. A max body temp of 84°F and max ‘out-the-front’ temp of 93°F was observed for HIGH. Very simple 2-stage twist interface. As you tighten the head, the light will turn on into LOW and as you continue to tighten, the light will jump up to HIGH. Loosen the head to reverse back to LOW; continue to loosen to OFF.